Surface Technology, global leader in the development and application of specialist surface treatments, part of Norman Hay plc, has achieved the aerospace industry quality management standard, AS9100 Rev C.
The AS9100 Rev C standard recognises management systems that address safety, reliability and quality concerns within the aerospace industry and the wider manufacturing and engineering sector. Considered a “gold standard”, the certification demonstrates Surface Technology’s commitment to continuous improvement and its dedication to providing customers with high performance, high quality products and services. Management systems with AS9100 certification benefit from improved efficiency and productivity, resulting in less waste, reduced work complications and fewer complaints. Customers will also notice that orders are met consistently, on time and to the correct specification. These advantages will enable Surface Technology to expand its presence in the aerospace industry and gain a competitive edge in this increasingly demanding sector. Andrew Courtney of Surface Technology, comments: “I am delighted that Surface Technology’s dedication to consistent high quality, responsiveness and attention to detail has been reflected in the achievement of AS9100. We specialise in developing solutions for customers’ specific challenges and this certification is further evidence for customers of our promise to always provide them with the best service for their unique needs. 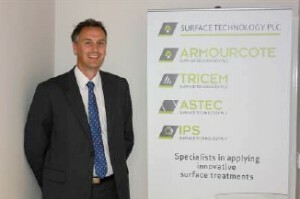 Surface Technology has more than 40 years’ experience in the development and application of high performance surface treatments for a wide variety of applications, with particular expertise in providing surface treatment solutions to customers in the aerospace, automotive and oil & gas sectors both within the UK and internationally. The company also currently holds the ISO9001 quality management standard and the ISO14001 environmental management system standard.